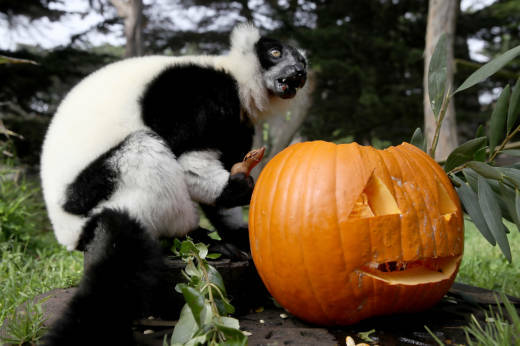 Get your science thrills on at any one of these special Halloween-themed events planned throughout the Bay Area. From haunted tours and pumpkin catapults, to creepy crawly bugs and magic tricks, we've put together a Halloween guide for science lovers. Put on a costume and head down to any one of these seriously spooky science events. Face your arachnophobia or bathe in your arachnophilia at this naturalist-led walk at Joaquin Miller Park. Come seek out the park's many spiders and bats and use UV flashlights to look for fluorescing scorpions. RSVP required. Come meet the producers of Deep Look and hear harrowing tales of how they captured the fascinating imagery for some of their creepy creature videos including black widows, flesh eating beetles, ticks, whispering bats and more. Also enjoy hands-on activities that might test your fear factor! Featuring special Halloween-themed activities in the Ingenuity Lab and Animal Discovery Room. Come watch a giant trebuchet send pumpkins flying across the sky and learn about engineering. Use the basics of engineering and physics to design hydraulic lifts. Then, grab some pumpkins and test the strength of your own hydraulic creation. The Hall’s Animal Discovery Room is also getting in the Halloween spirit with a collection of animal skeletons, brains, mealworms and other creepy animals. Featuring a showcase of live snakes and lizards. There will also be a special spider workshop. The event is an official stop for the ‘Trick or Treat on Lighthouse’ event in downtown Pacific Grove. Come for the candy and stay for the science fun. Costumes welcome. Celebrating the joys of inquiry through illusions, magic tricks, logic puzzles and philosophical exploration, while drinking special concoctions from the cash bar. Guests are invited to bring their own math puzzles, games, illusions, or magic tricks to share! This is a Celebration of Mind Halloween party and fundraiser for the Paradox Lab, a nonprofit startup with the aim of interesting kids in science. Featuring creepy tales about animals that live in the deepest, darkest parts of the ocean, such as the vampire squid and goblin shark. Learn how elephant seals can dive to 5,000 feet and stay underwater for two hours at a time without imploding. Discover how a sperm whale searches for its nemesis, the mysterious giant squid. Modern Satanism has a long history in the Bay Area, consisting of decades of left wing political work. Far from being baby-eating devil worshipers, modern Satanists act as an adversary against the mainstream, combining occult aesthetics with activism to protect religious pluralism. Learn about the history of Bay Area black masses and Satanism’s non-biblical origins. Explore what you eat and learn about the biology, chemistry, physics and even math of your food. Get hands-on and join scientists for some fun investigations at the South Berkeley Farmer’s Market. The Mission Science Workshop’s exhibits come to life and take over for one haunted evening. Come explore the scary side of science: walk inside the belly of an actual whale, dissect an eyeball, meet a python, dance with skeletons and more!